To infinity and beyond! Sigh. May the fourth be with you! Here's a highly ironic picture of Richard Dean Anderson from Stargate SG-1, etc. You know the deal by now: this is arbitrarily Star Wars Day because of a pun on the date, and not because this day actually has anything to do with Star Wars (the 1977 movie was released on 25 May). Time to fill our houses up with discounted vinyl junk in the shape of Yoda. Still, don't let my light cynicism stop you from hoovering up some classic (and not-so-classic) Star Wars games for less this weekend. Pretty much all the major digital storefronts are running sales themed around a galaxy far, far away. Steam has its complete collection of Star Wars games available as a bundle for about $76/£55, and big discounts on individual games too. You'll find deals at Humble Bundle and Fanatical, too. GOG is running a similar sale, and its selection of Star Wars classics is pretty impressive these days, particularly after the addition of Episode I: Racer. Just looking at all of that old Star Wars promo art makes me want to reinstall every Jedi Knight game and play them all weekend. Fingers crossed GOG rescues Battle for Naboo next. Origin, meanwhile, has new Star Wars Battlefront 2 for $24/£22, which isn't a bad price for an impulse purchase of a 63%-rated FPS, although I haven't returned to the game since the recent progression overhaul and I wasn't the biggest fan of the campaign, where in one level Luke Skywalker hits some bugs with his lightsaber for ages. It's worth noting that Star Wars: The Old Republic is also running a double XP event through to 11 May. 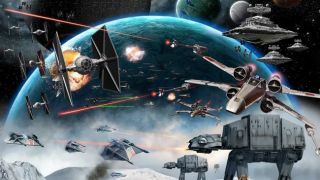 If you want some guidance on the best Star Wars games on PC, check out our handy list. You should then look at our worst Star Wars games list, where I complain about the shortcomings of Shadows of the Empire, a game I actually love and have completed ten times.